Pistorius's Story Challenged: Witness Heard Screams And Shots, Police Say : The Two-Way The Olympic and Paralympic sprinter is accused of murdering his girlfriend. He says it was a terrible mistake — that he thought there was an intruder in his home. At a bail hearing, the case is taking shape. South African sprinter Oscar Pistorius in a Pretoria court Wednesday. A neighbor has told investigators that he heard "gunshots ... a female screaming two-three times, then more gunshots" coming from the South African home of Oscar Pistorius in the early morning hours of Feb. 14, a police officer testified Wednesday at a bail hearing for the Olympic and Paralympic athlete. The witness has also told investigators about "non-stop talking" and sounds "like fighting" coming from Pistorius's home between the hours of 2 a.m. and 3 a.m.
As the BBC notes, those statements conflict with the account Pistorius has given of what happened when he shot and killed his girlfriend, Reeva Steenkamp. According to Pistorius, he heard a noise coming from a bathroom in his home and — thinking it was an intruder — fired four times through the door. 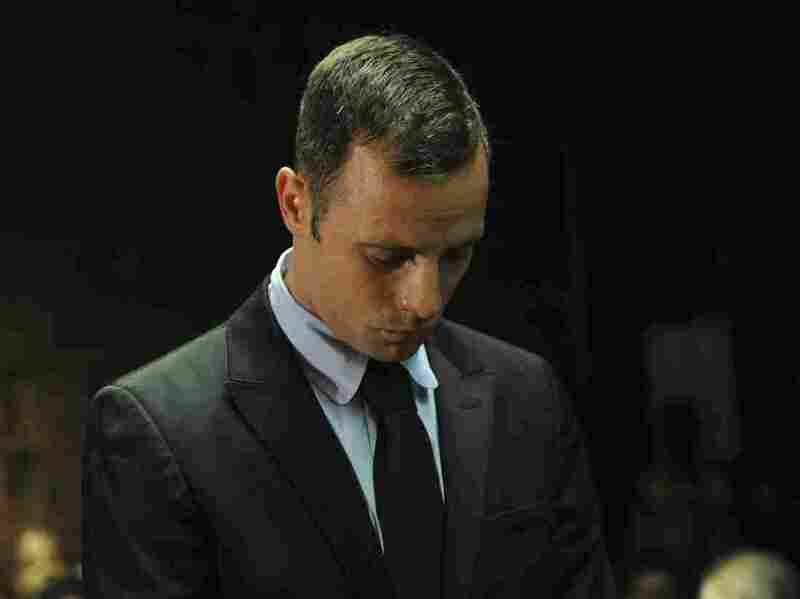 He thought Steenkamp was in bed, Pistorius has said. He denies prosecutors' allegations that he committed premeditated murder. The athlete's lawyer challenged the officer's testimony about the witness, The Guardian reports, by pointing out that the witness's home is about 300 yards from Pistorius's. Steenkamp, 29, was laid to rest Tuesday. "The investigating officer in the Oscar Pistorius murder case made an error in his court testimony Wednesday when he identified a substance found in the athlete's bedroom as testosterone, the national prosecutor said," CBS News writes. "Medupe Simasiku, the spokesman for South Africa's National Prosecution Agency, told The Associated Press that it was too early to identify the substance as it was still undergoing laboratory tests."